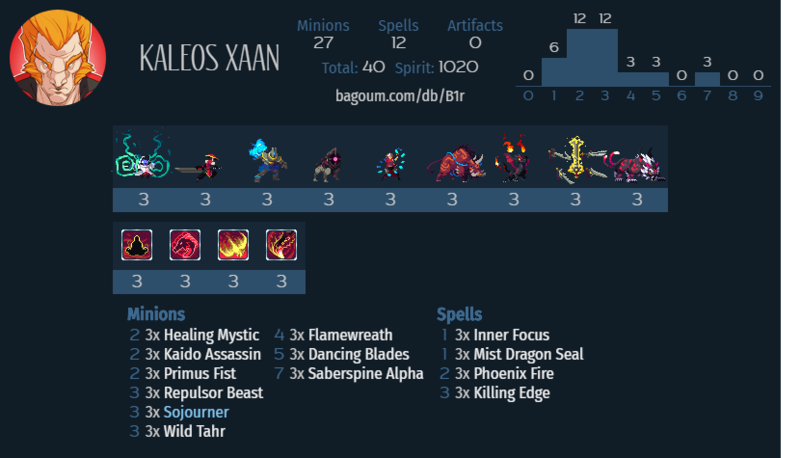 This is the cheapest deck of the bunch, and that’s partly because the epics that you do want in some of the other starter generals aren’t AS necessary in Kaleos. Juxtaposition is one of the best cards in the game, but it’s a little harder to use than Immolation or Makantor, and for a newer player isn’t going to swing the game in the same way. There are some other great epics you could add, but I’ll cover that in the upgrades section and I think it’s good to have a real cheap deck here. Kaleos got a real gift in Flamewreath, which is basically the reason to play Kaleos right now. Similar to Makantor and Immolation actually you will be left with a reasonable body and have done a sizeable AoE after you use your movement spells on it. It’s not the only card in the deck though, you should basically be looking to use your movement spells to setup favourable trades, backstabs, frenzies or Flamewreath procs. You have some fine burst when necessary and can use that along with your other tricks to end a game if your opponent does not respect it. How you take each turn should be more determined by what options you have in hand and what you expect from your opponent as the deck should be capable to perform quite flexibly and react well to a number of scenarios. Aside form Kaleos BBS these are our additional ways to get extra movement (and actions for Inner Focus) from our minions. These tools give us the ability to set up minions defensively, and then move them right onto the best position by the enemy. As I alluded to earlier these are great ways to get of Backstabs, Frenzy or Flamewreath, but are also useful just to get extra damage off. There’s so much I could talk abot on the use of these cards, but if I tried here I wouldn’t do it justice. Just play these yourself and I’m sure you will start to see why they are good. Or look up some tournament Kaleos games and you will see why these tools are so damn fantastic. Flamewreath is just great, if you build up enough tools in hand you can easily be getting huge damage off of this guy; eg. cast it, Mist Dragon Seal it somewhere, then blink it, then Inner focus it to move again and the finally attack. you got off 6 damage AoE and a 3 damage attack of and have a must-answer 3/3 left over. Sometimes the plays with this little guy can be hard to see the best way to do it, especially when you add Jux into the mix, but keep at it and this card is immensely rewarding and fun to play with to boot. Tahr is another good target to Blink or Mist Dragon Seal about, it stymies aggression by punishing the enemies attacks and if they cannot answer it may compromise their positioning as they may be forced to spread out to avoid it. Bonus points is you attack onto an egg or something and get to splash the frenzy damage with impunity, but most competent players won’t let you do that you can sometimes use Inner Focus to get a reasonable 2 damage AoE from hand. Backstab is a cool ability, and is real nice on a 2 drop. Open with this and watch as your opponent suddenly becomes hesitant to walk forward for Fear of having it Mist Dragon’ed behind them. It’s a little harder to make scary later on, but can still put in work if your opponent doesn’t have decent counterplay. Once you do get behind an enemy Blink works quite well to give it that extra threat range by blinking it in, or safety by blinking it out. A great buff spell that add huge damage to a minion, as well as some durability, additionally if you cast it on a Backstab unit (we’re running only Kaido) it draws you a card at the end of turn. Slapping this on a Thar for a big Frenzy is great but the extra stats it gives make pretty much any unit quite scary. Also remember that you can use Inner Focus and then apply a buff in order to reactivate a minion that now has been granted more attack than the restriction usually allows. Sojourner is the card draw in the deck, it has a large amount of HP and disincentivises attacking into it, which means that it’s likely to stick around. This is what Kaleos wants as he needs units on board to make use of his BBS. It therefore is a nice piece in the deck that can keep your hand going and makes good use of some of the buff tools in the deck. As mentioned above Kaleos makes great use of some of these larger bodies by extending their movement, letting him back off, position defensively and decide trades, these two are the top end of the deck and can be used offensively or defensively depending on the situation. Dancing Blades can keep you tempo positive in the midgame by cleaning up a threat and sticking around itself. Alpha can do the same, but also has the possibility of providing some direct damage to end a game. We need to fill out our two drops and these guys are the choices, you’ll see them not only in a lot of budget decks but a lot of tournament decks too. They are fine if you use them as an opening play and have to skip their Opening Gambits, but remain effective into the midgame by helping you to take favourable trades and preserve minions that may otherwise need to be used up. Stellar cards. Almost the Flagship Songhai card, Phoenix Fire is a cheap and flexible damage spell that you’ll likely most often use on minions, but can also be used to burn your opponent and end a game. A concession to the fact that we’re not balls to the walls aggro and don’t always have huge burst to finish a game off, which means we may run into issues with certain large enemy units in the mid/late game. You can also use this to force positioning for backstabs/frenzies/Flamewreath or just push the enemy to a corner. Jux, Battle Panddo & Bakezori could be good initial upgrades. Panddo particularly is an exceptionally powerful standalone card. Jux and Bakezori dip into the movement aspect of Kaleos, Onyx Jaguar also does this if you’ve fallen head over heels with the movement theme. Scroll Bandit is a great card that works great with Mist Dragon Seal and Juxtaposition to set up early backstabs that can set your opponent far behind if they don’t respond well. Thunderhorn used to be a monster, but is now a cool option to set up chains with Juxtapostion, far from necessary though. Hamon & Zendo is a option favored by a number of players to put out a game winning opportunity very early, Zendo can also work with Thunderhorn, though both have been nerfed from what they used to be. I really enjoy Kaleos and I hope you do too. This deck tries to set up a board while controlling its opponent’s board at the same time with value trades and removal till its board explodes with an Onyx Jaguar play. With the right hand lethal can appear almost out of nowhere.